A diesel mechanic, with no formal training in hydraulics, was injured as a result of a catastrophic hose failure that he caused while performing an internal leakage test on a hydraulic pump. He was using an in-line flow-meter equipped with a load-inducing ball valve to perform the test. The pump he was testing was the main pump in a closed-loop (hydrostatic) transmission that drives the transport/mix barrel on a ready-mix concrete truck. While he was performing the test, the ball valve that he was using to develop pressure in the pump, unexpectedly closed and abruptly stopped the pump flow. This caused the hose-end to sever from its connection at the pump. When the hose burst, it whipped around, striking him on the shoulder. The force of the blow knocked him to the ground. He suffered lacerations and bruises from being struck by the hose, and minor facial and chest burns from the contact with hot oil. 1) The victim's objective was to perform an internal leakage test on the pump in a closed-loop (hydrostatic) transmission system (see Diagram 1). 2) He knew that there was a practical and safe method to stall the mixer barrel on the truck. 4) Although the victim had never used a flow-meter before, it was his understanding that the ball valve was installed on the flow-meter for the purpose of generating an artificial load (pressure) in the pump (see Diagram 3). NOTE: HIS FIRST MISTAKE DUE TO IGNORANCE! 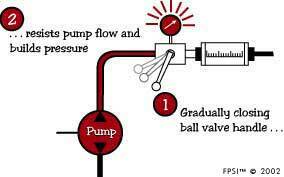 Under certain pressure and flow conditions, a ball valve will close automatically. A ball valve should NEVER be used for fine metering. A needle valve is a better choice. 6) He had the machine operator start the machine and engage the pump control lever to the maximum speed (maximum flow) position. 7) While maintaining the flow, indicated on the flow-meter, he gradually closed the ball valve and began to generate pressure. He observed the pressure on the pressure gauge. 8) He raised the pressure in approximately 200 PSI (13.8 bar) increments. He passed 1000 PSI (69 bar), 2000 PSI (138 bar) and 3000 PSI (207 bar). When the pressure reached approximately 3700 PSI (255 bar), the handle on the ball valve unexpectedly pulled out of his hand and shifted into the "shutoff" position, stopping the pump flow abruptly. 3) After he consulted with the representative from his local hydraulic component supplier, he purchased an in-line flow-meter test kit. The test kit assembly included an in-line flow-meter with an attached ball valve and a pressure gauge (see Diagram 2). 5) He disconnected the lines from the hydraulic motor and connected them to either side of the flow-meter test kit (see Diagram 4). NOTE: HIS SECOND MISTAKE DUE TO IGNORANCE! When he disconnected the high pressure transmission lines from the motor ports, he did not realize that he removed the pressure relief valves from the circuit. Given these two elements, he inadvertently set the stage for a serious accident. 9) This was immediately followed by a loud explosion. The extreme pressure created by the unexpected closure of the ball valve caused the hose-end to burst. Full pump flow discharged to atmosphere through the open hose. 10) Oil discharging from the broken hose at extreme velocity caused the hose to whip back-and -forth violently. The victim was unable to move out of harm's way. The hose struck him on the shoulder and knocked him to the ground. Hot oil sprayed into his face and upper body, causing minor burns. He received cuts and abrasions from the contact with the hose and the fall. Realize the importance of training. A trained person has the ability to recognize hazardous situations and do the job safely. If your supervisor or manager assigns you a task that you are unfamiliar with, let him/her know. Remember, they are responsible for your safety. Contrary to popular belief, a mechanic doesn't know everything! Use the proper tool for the job. In this case, the flow-meter test kit should have been equipped with a needle valve, NOT a ball valve. If you have a flow-meter with a ball valve in your shop, remove it immediately and replace it with a suitable needle valve. This hazard is not peculiar to closed-loop systems. Any hydraulic system that has a remote relief valve is vulnerable to this hazard. Discuss hydraulic safety in your safety meetings.